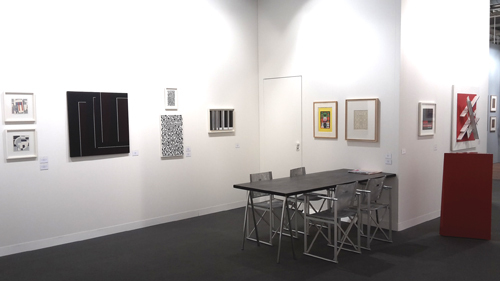 For our 47th consecutive appearance at the Basel Art Fair, we are featuring Aurélie Nemours (1910–2005) whose work we showed at the gallery in late 2015. 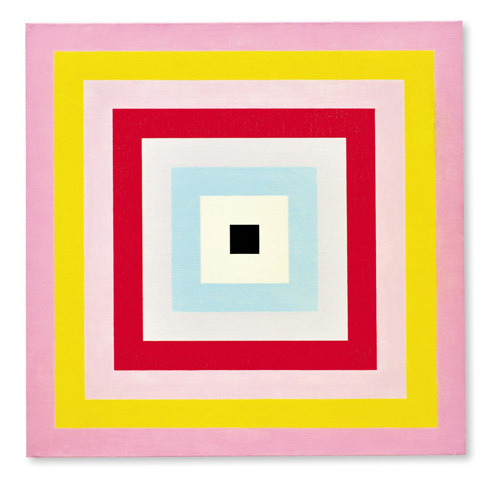 Nemours, who died in 2005, was the grand lady of French abstraction. Painting was always crucial to her life, for she began painting at a young age, initially just for herself. The public only discovered her work when she was forty-three, a deliberate strategy designed to leave behind a mature oeuvre. Support for her work came above all from artists such as Auguste Herbin (1882–1960), Marcelle Cahn (1895–1981), Jean Gorin (1899–1981) and Gottfried Honegger (1917–2016). Nemours was a model of humility yet also militantly defended geometric art ; discreet yet present, she was curious about the work of other artists, especially the young generation embodied by Dubreuil and Popet, whom she advised and backed. She joined Groupe Mesure in 1961, exhibiting in conjunction with the group at the Musée des Beaux-Arts in Rennes and in Germany. It is impossible to speak of Groupe Mesure (1960–1966) without mentioning Groupe Espace (1951–1957), founded at the initiative of Félix Del Marle in 1951, followed by André Bloc. In that post-war period these artists were aware that everything had to be rebuilt, that an appealing new mode of coexistence had to be forged. Using art to help create a more peaceful environment was thus one of the watchwords not only of Groupe Espace, but also of Groupe Mesure. It might be thought that such an approach could arise again, after the events that afflicted Europe in 2015. Groupe Mesure, also known as Groupe Expérimental de Recherches Plastiques (Experimental Group for Visual Research) was founded 1960 by Georges Folmer (1895–1977, president of the association) along with Jean Gorin (1892–1982, vice-president). It was mainly composed of “geometric abstractionists” associated with the Salon des Réalités Nouvelles, whose wall space was largely infringed by the spread first of tachism and later of art informel. The Mesure artists picked up the idea of a synthesis of the arts developed by Groupe Espace in 1951, all the while seeking to allot the constructivist aesthetic a greater role in architecture. They focused on the organization of exhibitions and events in France and abroad of non-representational art in conjunction with architecture. Hence they held only one show in France (and the Musée des Beaux-Arts in Rennes) and eight in Germany. 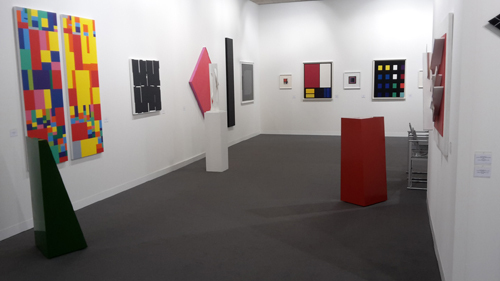 For its first exhibition, held in Rennes in 1961, Groupe Mesure marked its historic link to geometric abstraction by also showing works by recently deceased masters Frantisek Kupka and Auguste Herbin. Aurélie Nemours served as a model of perseverance and determination for an entire generation of artists. 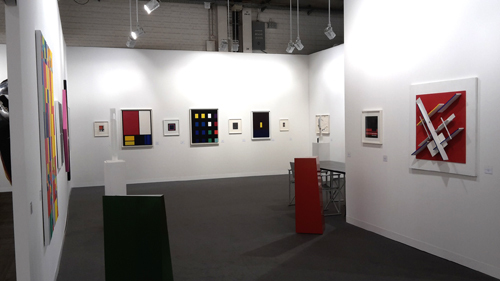 Our Basel stand will include a few key members of Groupe Mesure (Georges Folmer, Jean Gorin and Luc Peire) as well as artists who supported Nemours (Auguste Herbin, Marcelle Cahn, and Gottfried Honegger) and ones she encouraged in turn (Jean-François Dubreuil, Yves Popet, Charles Bézie, Jean-Michel Gasquet, Ode Bertrand and Henri Prosi).